During a poverty alleviation cooperation conference held by the State Council in May, 1996, 10 prosperous eastern provinces were paired with ten less-developed regions in western China to provide economic assistance. It was at this time that Fujian province was appointed to aid Ningxia. In October of that year, a leading group led by President Xi Jinping, who was then deputy party chief of Fujian province, was established. Then Minning town was founded. Located in Yongning county, Ningxia Hui Autonomous Region, Minning town administers six villages. The first half of its name, Min, refers to Fujian, while Ning stands for Ningxia. Over the past two decades, more than 60,000 people have settled in the town. Most found work in new businesses that were established with investment from Fujian, while others worked in cities. Businesses ranged from agriculture and animal husbandry to real estate, wine production, and tar and gas businesses. According to Nxnews.net, a Ningxia-based news outlet, in the town, per capita disposable income of farmers has risen from 500 yuan (US$80) in 1997 to 10,732 yuan (US$1,630) in 2016. In his 2016 trip to Minning, President Xi Jinping said that the area had been transformed from a desert to a paradise, and that its experience should be applied in more areas. Located in northern Minning, Yuanlong is the largest among the “relocation villages” in the county, whose population is made up of communities from nearby areas, namely 13 towns in Yuanzhou district of Guyuan city and Longde county. In the village, one can see rows of homes and greenhouses covered with solar panels, as well as raspberry patches and grapevines. 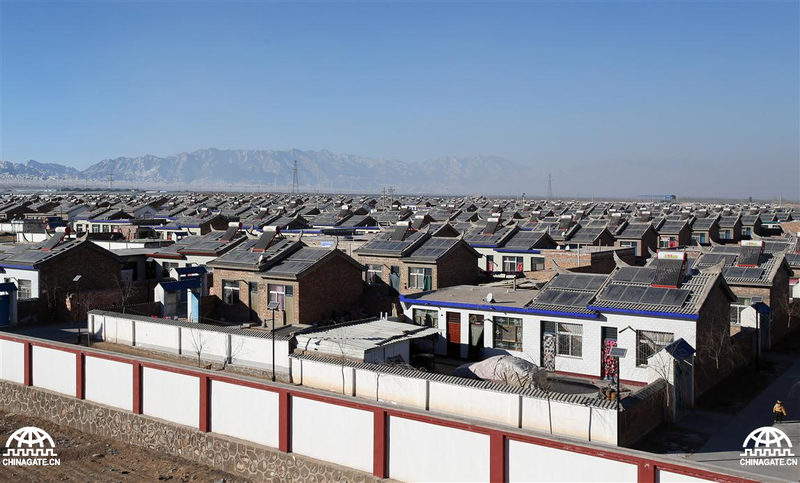 According to Wang Sheng, party secretary of Yuanlong, design and construction of the village began in 2010 and people started to move in their new houses in May 2012. In September of 2016, a total of 1,998 households or over 10,500 people got new houses.